Charles Courtemanche, an economist at the University of North Carolina at Greensboro, has produced a study suggesting that permanent hikes in gas prices may slash obesity rates. The amount is hardly nominal: A sustained $1 increase in the price of a gallon of gasoline equals a 10% dip in the nation’s obesity rate--that's about 9 million fewer obese people clogging up health care systems and costing society (and themselves) money. "The price of gas is a powerful lever when it comes to medical expenses and mortality rates," Courtemanche says. "There’s a savings in this for all of us." Courtemanche found evidence in his data that rising gas prices resulted in more Americans walking and more Americans bicycling. Perhaps just as important, he noticed that, as gas prices increase, people eat out at restaurants less. In addition to more strolling and cycling, people use public transportation more, Courtemanche says, and that, too, burns far more calories than sitting in a bucket driver’s seat, sipping coffee, and flipping through radio channels. People who use subways, buses, trolleys or commuter rail services need to get to and from mass transit stops, and that probably means more walking on both ends. A $1 rise in gas means 11,000 fewer lives lost to obesity-related causes and $11 billion per year saved on health costs, Courtemanche says. Good stuff. The connection to rising gas prices and reduced restaurant visits is fascinating and one that I certainly would not have immediately recognized. The same goes for the fact that public transportation use burns more calories than driving -- obvious in retrospect but still easy to overlook. And once gas gets up north of $6 a gallon, according to Courtemanche anyway, that's when you'd start to see a transformation away from a car-centric culture as gas prices start to affect housing and relocation decisions. 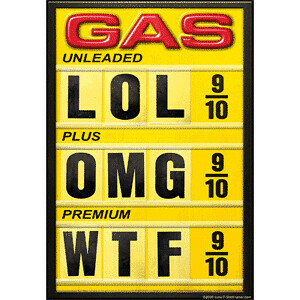 Of course, we may not need gas taxes for all that -- economic recovery plus peak oil may yet get us to the same place. It's just a further indication that our policy choices for addressing obesity need to include "all of the above." While I think it would be great if we would all walk and bike more, I'm not sure gas prices are the best lever to use to get people to eat out less. Because you know what else would have the same effect? Making everyone poor! But that would be a little bit perverse.